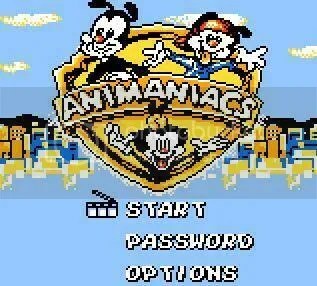 If you grew up in the 1990s, chances were good that you were a fan of Animaniacs, a fantastic Warner Bros. cartoon that ran for several seasons. And like most cartoons, it spawned off a few video games. 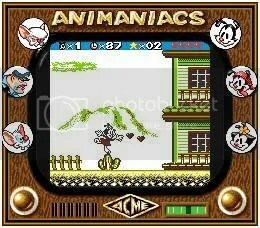 In 1994, Konami released Animaniacs for the SNES and Genesis, but both were very different games. Wherein the SNES was hectic, frustrating, almost brawler-like affair, the Genesis version took a more straightforward platforming approach. The following year, Konami released a version of the Genesis game on Gameboy, though a couple of levels were trimmed out. The gameplay is rather basic, almost puzzled based, as there are few enemies and most of the danger comes from environmental hazards. However, what’s amazing about this title is the amount of effort poured into the Super Gameboy support. The graphics recieve a colorful upgrade, not only providing a colorful status bar, but the game uses various tricks to display more than the standard four colors in the gameplay screen, and even more on static screens, such as the level select and cut scenes between levels. The sound is even more impressive, replacing tinny tunes on the Gameboy with near SNES level music. It’s actually quite amazing to see, and though it seems odd that a licenced Gameboy game would receive so much detail to it’s SGB mode, when you realize that this version was developed by Factor 5, it makes sense. The game is decent, though some parts are a bit too frustrating for its target audience. I wouldn’t necessarily pick the game up for its gameplay; but if you want to see the Super Gameboy pushed to its limits, this is the game to try out. You are currently browsing the Game Blog of AWESOMENESS blog archives for January, 2011.